Want to see what being painterly can do for your art? I'll show you in just a minute. In last week's blog post I asked how many people wanted to learn the specific ways you can change what you see in order to put more interest and excitement to your art. I called it adding "life", and every artist uses these methods in their own way. 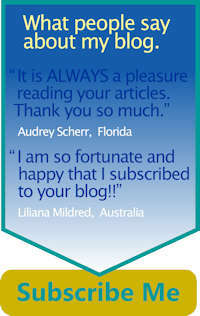 I was especially pleased to hear from a friend of mine who is also a subscriber to this blog. And second by depicting that something in a looser, painterly manner. "Now that I have completed the many things I needed to do in and around the house I am dedicating a little bit of time to practicing my oil painting. A few months back I purchased a large piece of Masonite and cut it all up in very small (5x7) pieces, primed them with gesso with the idea of practicing what I have learned from your many lessons; I find it very relaxing and hope to do better as I continue practicing painting with a pallet knife." And he sent a couple photographs of what he'd painted so far. As you look at these, be mindful of a couple things. 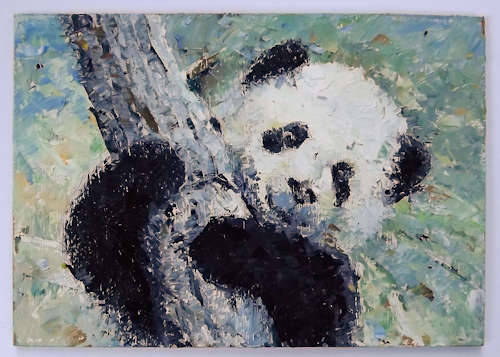 One: that he is using only a pallet knife. And two: that Sal isn't really a beginning artist. He subscribed to my blog a few years ago and took a course from me. His work was more hard edged then, and he has said since then that one of his major goals is to become more painterly in his work. I'd say he's well on his way to that goal. And he's getting there doing one of the things I've recommended in these blog posts. In these little 5 x 7 paintings he can still play with color, practice good design, practice being painterly. All the things you need for successful art. And just have fun with each subject without the pressure we often put on ourselves when we try do a full-size "Painting." Notice that everything is first drawn correctly. Then he creates a design in each one. 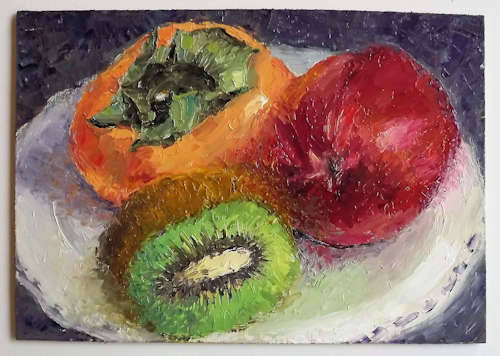 In the fruit painting the plate is allowed to extend off the bottom of the painting. The kiwi is cut in half. He created a diagonal design with the koala. And then look at those soft painterly edges. P.S. I was about to add that he took two ordinary subjects and made them fun to look at. But, that's not quite true. A koala is definitely not ordinary. I mean; how can you go wrong painting anything that cute? Well, the truth is you can. It doesn't matter what subject you choose to paint. In order to create a successful painting, your subject needs to be drawn well first. Then put into a thoughtful composition and finally painted with panache. These are all part of being painterly.